I spent most of the wet cold weekend spent knitting by the fire, resting and relaxing. and I decided that Annie and I would have a tea party. We had some breadsticks, some wee museli bars and some gingerbread bears. and filled our teapot with water. they are just right for a little palate, not too gingery, just right. and the texture was just right for little people too. Little Bellies believes that a healthy little belly feeds a healthy little mind. Their aim is to develop children's foods that are not overly sweet, with no refined sugars and reduced sodium content. They use nutritionally superior ingredients such as organic whole grains and real fruit, with as little processing as possible. I like that they are specifically designed for little people to eat. I would have loved these great products to feed her. I think I could sneak these breadsticks even in a Steiner lunchbox which is fantastic! I'll definitely be buying some to have in the cupboard! Edit: Some products do have dairy products, check the label. Maybe you don't want to mail to the US, but my daughter would love these for her 2 year old. She doesn't give him any processed food, and buys organic whenever possible. Love your photos with your picnic quilt and the pillows in the background! I'm like Mother Hubbard but not. Everytime I go to my cupboard it looks bare. In fact it has lots of things to make something with but not the instant snack that I'm sometimes after for my children. I've a dairy free girl who'd love to try these. I'll have to have a look for those at the supermarket, I'm a fan of having something in my bag for those unexpected moments. 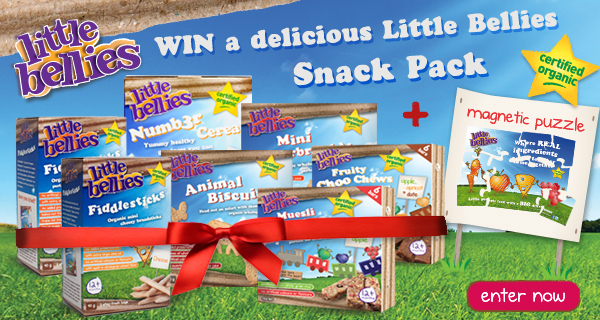 I'd love to be in to win, finding nice and healthy in the same box (without having to bake) would be wonderful! I would love to win this prize pack- my two sons seem to constantly raid the pantry and I would appreciate them having some variety and healthy options. They look very yummy, bet the small boy would love the gingerbread men too (and me). Might have to go to countdown to find some.